Here is the rare "show-it-off" Empress piece for your Homer Laughlin Collection from the 1930's! 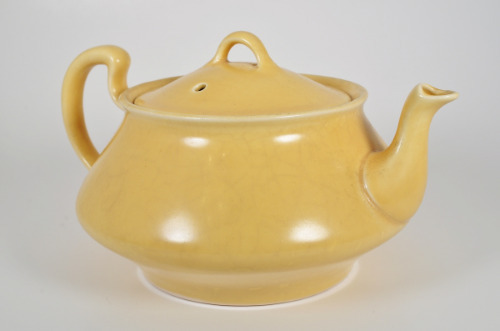 This Empress Melon Yellow Art Wells Glazes Teapot is in excellent condition with very minimal and natural crazing. The smooth and solid Melon Yellow color will stand out among your prized pieces. No chips, cracks, or hairlines anywhere. The hallmark is very plainly stamped, bold, and very readable. This teapot was not part of any of the Homer Laughin Dinnerware Lines. It had to be special ordered, thus adding to the rarity of even finding this piece today, much less, one in this kind of great condition. We could only find two sample pictures on the Internet and none at all for sale. Only made in two colors, the Blue version of this, (named Blue Vellum) wasn't even made until 1932, so this piece is likely before that date, but could still be within the earlier 1930's. The teapot will ship TRIPLE boxed with superior packaging to assure safe and undamaged arrival at your door. Please contact us for any questions you may have. We always respond quickly to all questions and comments.